As I begin to write this post, I am actually having a hard time believing that we have been to the Galapagos. A Galapagos vacation had been on our family travel bucket list for so long that I thought we might never get there. Over many months of contemplation, however, a “Maybe we should….” eventually became a “Let’s go for it !”, with the plan likely solidified on an evening involving too much wine. I would go on to spend weeks researching the best Galapagos tours and the best islands to visit in the Galapagos. I remember feeling quite overwhelmed by all the different options available for Galapagos travel. I had to first work out which was the best way to see the Galapagos — by land or by sea. Recent years have seen the addition of some fantastic Galapagos Islands resorts making a land-based vacation a very viable option (and often a much cheaper one). In the end, I concluded that we could see more of the Galapagos by cruise ship, and thus began to research the various boat options. Big boat or small boat? Catamaran or Monohull? 4 day or 7 day Galapagos cruise? 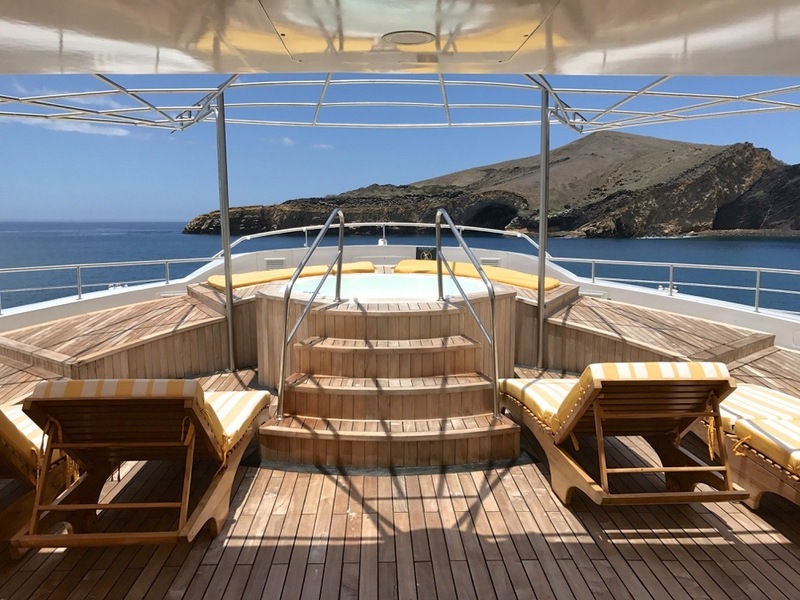 I’m not sure how we eventually got there, but at some point we decided to just go for broke and splurge on an 8D/7N Galapagos luxury cruise on the M/C Petrel —Haugan Cruises newest catamaran . You only go around once, right? In this post, I am going to share a little bit about our Galapagos Islands cruise on the M/C Petrel, but I also am going to try to answer a bunch of questions that you may have about the Galapagos (and that I had prior to our trip). 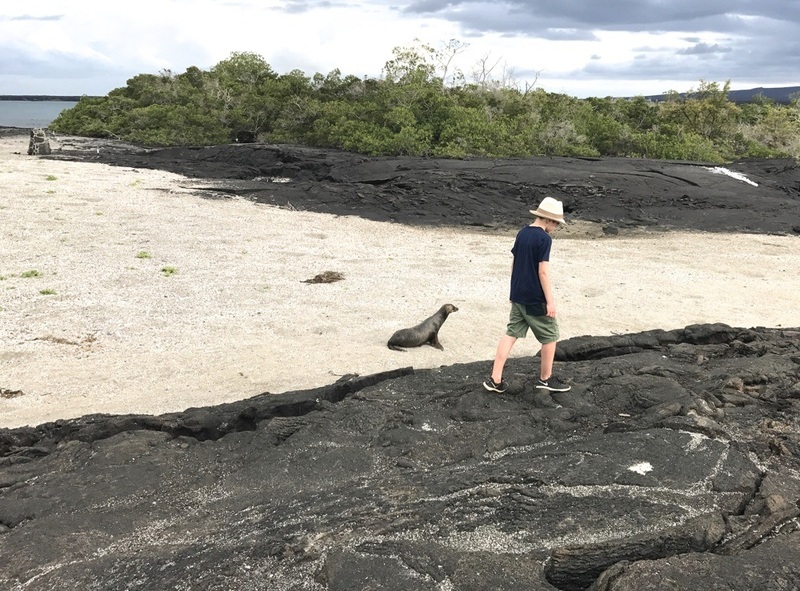 We were on a Galapagos family trip (our kids were 9 and 12 at the time), so this post contains some information about the experience of visiting the Galapagos with kids. But first, if you want to have a little peek, check out our Galapagos cruise video. Rather than looking at your trip as a Galapagos Islands vacation, you might be better to look upon it as an adventure. Days start early on Galapagos boats so guests can see wildlife at its most active and also to avoid the mid-day heat. 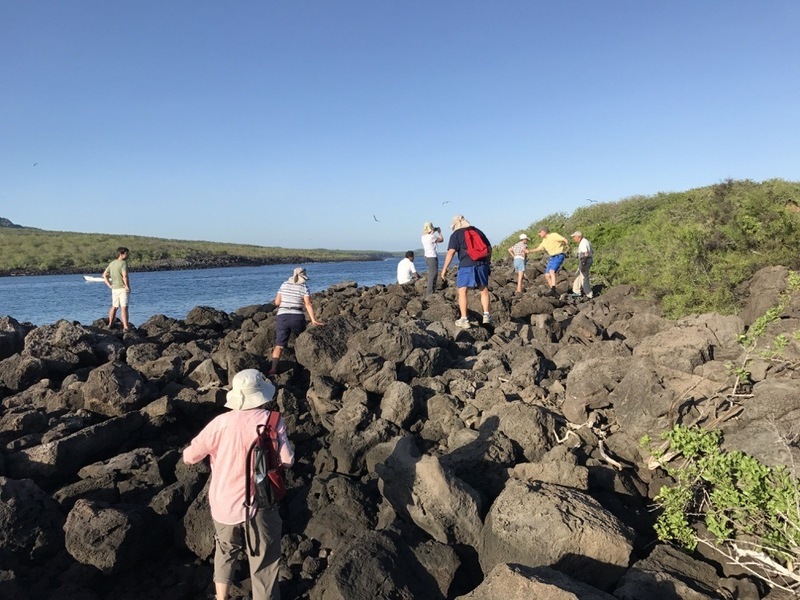 A typical day on a Galapagos cruise ship might involve a 6am wake up call for an early morning excursion (then back to the boat), snorkeling at 11am (back for lunch), a late afternoon island excursion, and a pre-dinner briefing of the next day’s activities. Most guests on our boat were in bed by 9. Note: If you have some flexibility, you might want to plan some downtime after your Galapagos trip (rather than heading straight to work, or out on another adventure). Many people like to combine Ecuador and Peru in one trip, but I would definitely suggest a couple days of relaxation in between (having just done a separate family trip to Peru which was amazing, but equally exhausting). Also important to know is that you are on a guided tour most of the time. 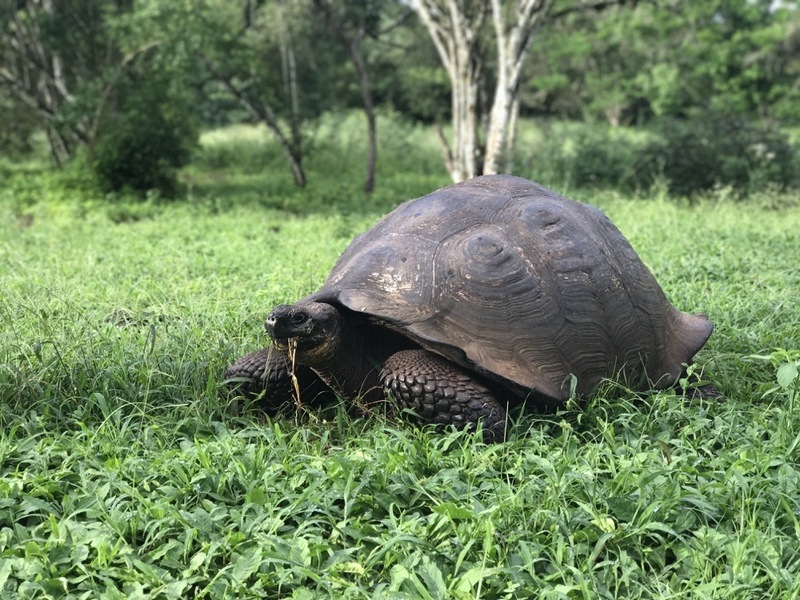 97% of the Galapagos Islands are within national park boundaries and local regulation requires you to be in the company of a certified naturalist guide (which means for almost every excursion). We are not tour people, so this was a little hard for us. Your guide needs to cater to a whole group of people with varying interests. One group member might want to learn all about the medicinal qualities of the bark on a particular tree, for instance. It also requires great patience to listen politely to everyone’s questions, even when that question may have been answered 3 times already. (Not judging…. I am easily distracted too.) I was worried about how our kids would do on these long tours, but they were great. I am glad, however, that we did not try this when they were younger. 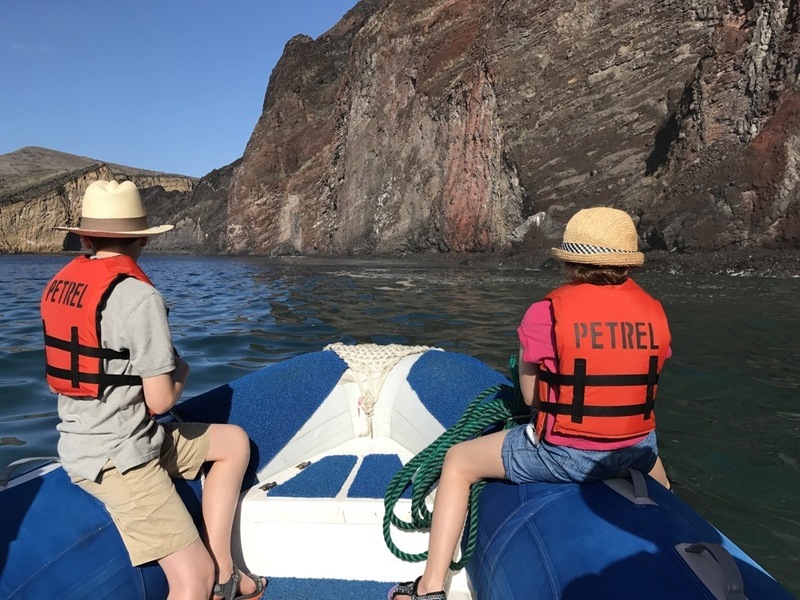 Most family-friendly Galapagos boats have a minimum travel age of 7 years, and I can see why this would be important (see exceptions in the FAQ below). Our 8 day Galapagos cruise started on the island of Balta, and set off in north-westerly direction. Our stops included North Seymour Island, a number of unique locations on the island of Isabela, Santa Cruz, Santa Fe, and finished on San Cristobal. I spent some precious research time agonizing over the perfect Galapagos Islands itinerary, but I have come to the conclusion that unless there is a specific species that you simply must see, most itineraries would be great. On our Galapagos boat tour we missed out on the red footed booby, but there was so much else to see, it really didn’t matter. The one absolute highlight for us, however, was snorkeling with sea lion pups off the island of Santa Fe. My husband had done the same thing on a trip to the Galapagos twenty-five years ago and couldn’t wait to experience this with the family. This beautiful 16 passenger catamaran is Haugan Cruises newest ship. As a family of four, we took 2 cabins — one with a king bed, and another across the hall with two twin beds. 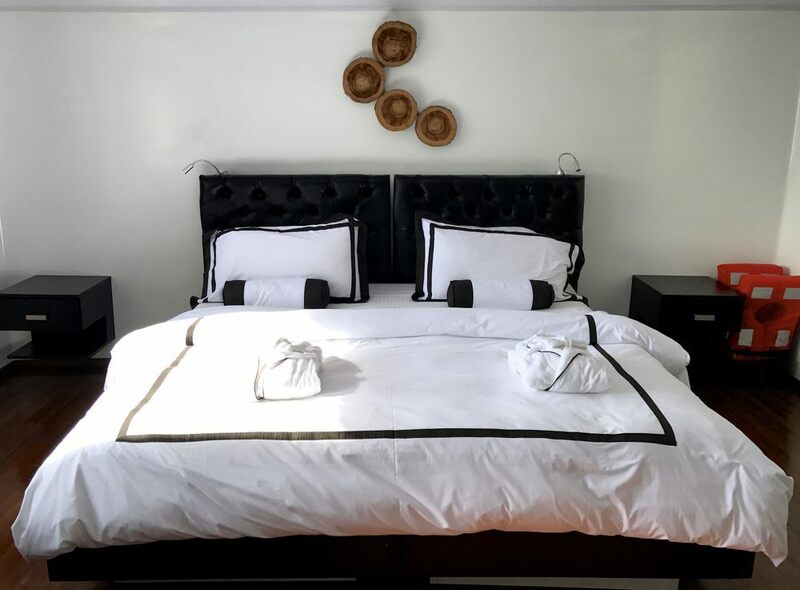 Rooms are tastefully decorated and have some nice luxury touches such as plush robes and L’Occitane toiletries. Every suite has its own balcony, which is really nice to have when you need a little downtime. The main floor has a spacious sitting area, where guests are welcome to help themselves to complimentary snacks or non-alcoholic drinks. (My kids ate a week’s supply of Oreos in about 3 days. They aren’t used to be so “unmonitored” with treats.) Meals were good — exceeding my expectations considering we were in the middle of the ocean. Most were served buffet style, but guests with dietary restrictions were offered a special meal. I was particularly impressed with the fact that on several occasions the chef offered to make something kid-friendly for my children, despite the fact that we had not asked (they were delighted). Also very enjoyable were several lunchtime BBQ’s on the upper deck . Every boat is going to be different, but on a luxury boat such as the M/C Petrel, everything was made as easy as possible for guests. Our early mornings began with a gentle and musical wake up call over the PA system and the cappuccino machine was at the ready. Upon our return from each excursion, staff would be waiting to help us with our gear, and offer us some kind of fresh juice or delicious snack. While we were out, our rooms were refreshed. 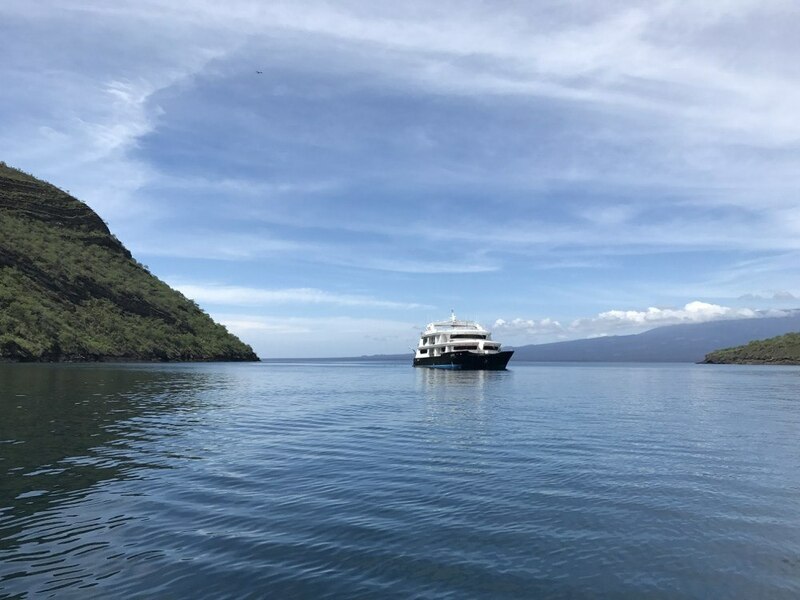 We chose to take our trip with Haugan Cruises for a number of reasons, but one of them was that we were looking for a small ship. Haugan runs three small ships in the Galapagos — the Petrel, The Cormorant and the Ocean Spray. All of them are lovely. Typically, we are not cruise people, and we assumed that we would prefer a smaller group to a larger one (and we stand by that decision). We also did not specifically seek out a boat catering to families, although my kids were made to feel very welcome on the M/C Petrel. My kids were 9 and 12 at the time of the cruise and thus didn’t require a lot of specific kid-friendly amenities. More on this in the FAQ section at the bottom. As mentioned above, a typical day on the boat involved 2-3 excursions, ranging from 1-3 hours each. Proper attire and footwear was pretty critical as the terrain was variable (lava rock, wet landings, dry landings etc.) and most islands offered little or no shade. Excursions were optional and at least half the guests on our boat skipped one or more for various reasons. 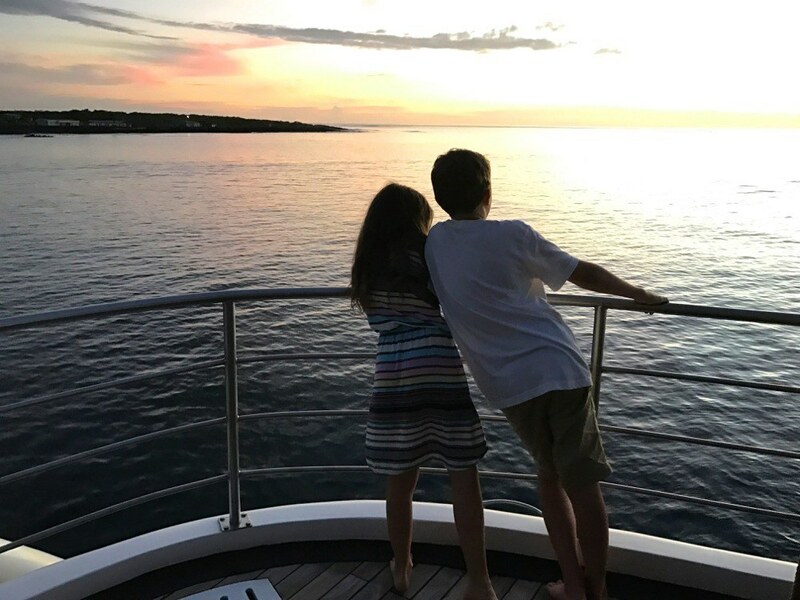 During our 8 days on the boat, we let our kids skip 2 that we thought would be less interesting for them, as they simply needed a break. They stayed behind to play cards with another guest (although the staff had also kindly offered to put a movie on for them). I had so many questions about the Galapagos before visiting and perhaps you do as well. I’ve tried to cover some of them here, but by all means, please reach out to me in the comment section below if you have others and I will do my best to help. The Galapagos has two seasons. December to mid-June is warm and wet (warmer waters, calmer seas, more rain). Cool and dry runs from mid-June to November. We were there in March and experienced only a few short periods of rain during the week (but it rained in the tropical fashion — a downpour). 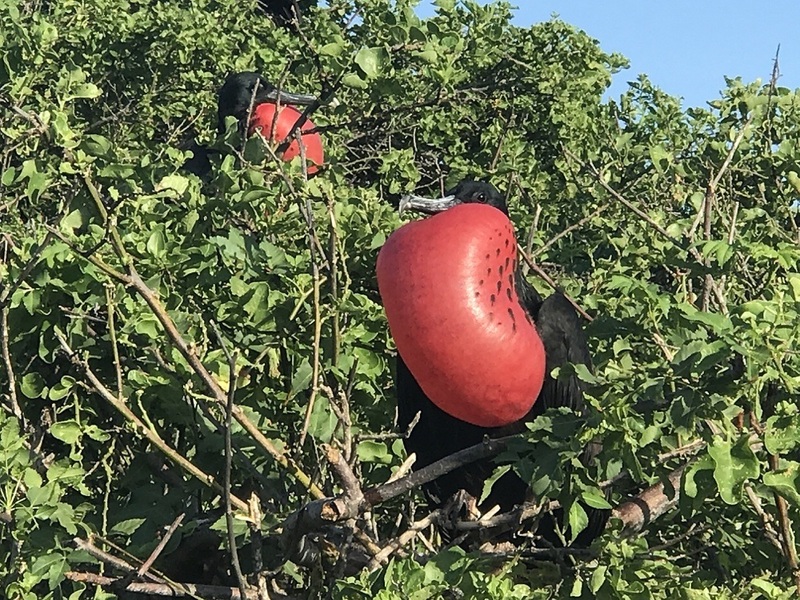 There is something interesting to see all year long in the Galapagos, from tortoise eggs hatching in January, to spotting whale sharks in the north in November. Unless there is something specific you need to experience, such as the waved albatross nesting on Espanola in April, you should not be disappointed. High season in the Galapagos is generally during school breaks June-September and from December-January. What is the best way to see the Galapagos? Personally, I feel that you can see a lot more of the Galapagos by cruise ship than you can by land. Cruise ships do much of their travel at night, allowing you to spend more of your daytime hours on the islands, rather than in transit to other islands. That said, a land based Galapagos vacation will probably cost you way less. There is also the age of the travelers to consider. 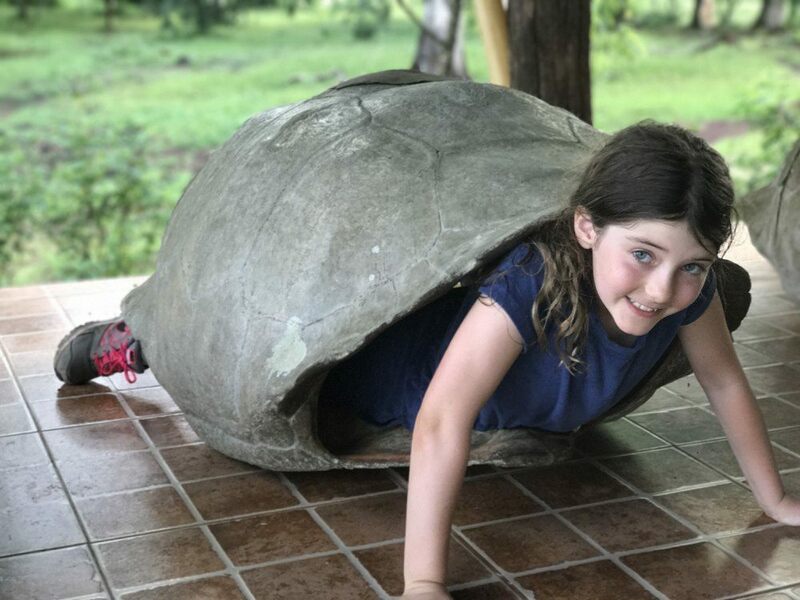 A land based trip can offer you a lot more flexibility on timing of tours and planning rest days, especially if you have little ones or are on a multigenerational Galapagos vacation. How do you get to the Galapagos Islands? The Galapagos Islands belong to Ecuador and are located about 1000km from the coast. Flights to the Galapagos generally originate in Quito (early in the morning) and make a stop in Guayaquil to pick up more passengers. If you are only going to the Galapagos, you may want to fly from Guayaquil as it offers a later start in the day. As we had planned a larger adventure in Ecuador with kids, we chose to visit Quito, a hacienda in the Ecuadorian highlands and an eco lodge in the Cloud Forest prior to visiting the Galapagos. What can you see in the Galapagos? During our 8 days, we had the pleasure of walking amongst fearless (and flightless) cormorants, frigatebirds, nesting gulls, land tortoises, land iguanas, marine iguanas, penguins, and sea lions basking in the sun (plus much, much more). We also enjoyed snorkeling with gorgeous fish, sea turtles, baby sea lions and the odd marine iguana. 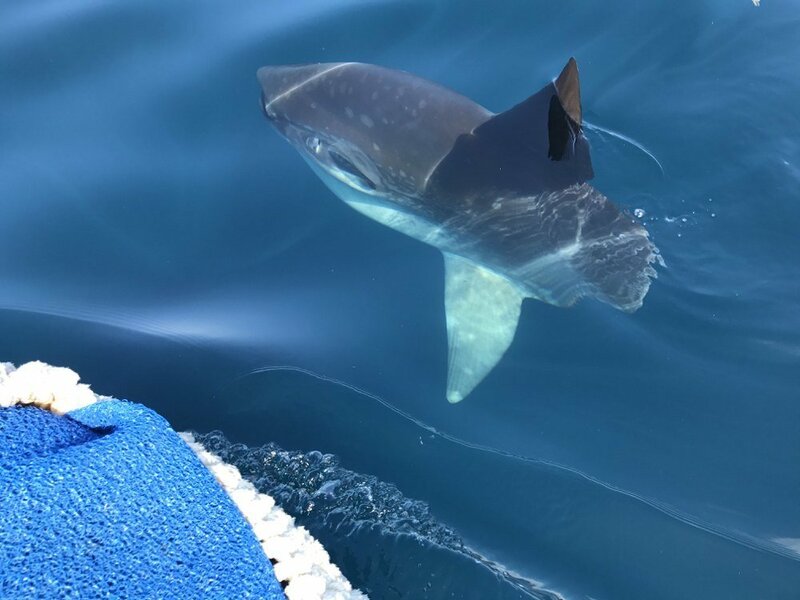 The big surprise, however, was the great pleasure of relaxing on the boat in the evenings as a family, stargazing and watching the sea lions and reef sharks swim around the boat. In a world where we are constantly inundated by technology, there was something really beautiful about having no cell service, no wifi, and just the creatures of the ocean and a sky full of stars to keep us entertained. How much does a Galapagos cruise cost? I don’t care what budget range you are in, a trip to the Galapagos will seem expensive. Above and beyond the cost of a Galapagos cruise or hotel, your flight from mainland Ecuador to the Galapagos will cost roughly $400 USD pp roundtrip. Visitors must also pay a $100 pp Galapagos National Park entrance fee ($50 for kids under 12) and a $20pp tourist transit card fee. The cost of a Galapagos cruise will depend on the class of ship, but generally you are looking at anything from $400 USD per person, per day (Budget) to $700+ USD per person, per day (Luxury Ship). You should also take into account all the stuff you might need/want to buy for a trip to the Galapagos. I bought a new iPhone, a GoPro, a hat, some lightweight clothing, a proper raincoat and wetsuits and snorkel gear for my kids. Did I need to buy all of this? Of course not – but it just happened. Tipping also needs to be considered as outlined below. 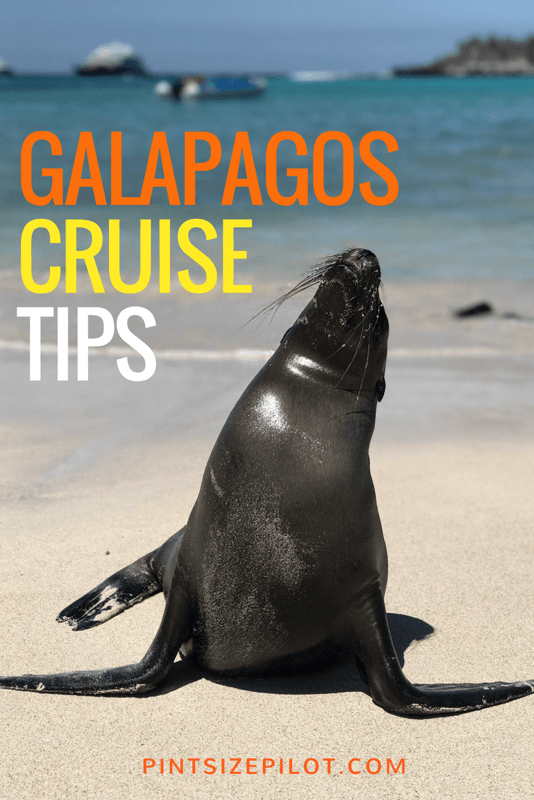 How much should you tip on a Galapagos cruise? Most cruises will give a suggested tip amount per day to be split between the guide and crew (usually in an FAQ section on their website). The amount of the tip should depend on the quality and level of service. $10-$15 per passenger, per day is probably suitable for a standard ship. The guidance from the Haugan Cruises website for their luxury ships was as follows “If service was excellent, the average tip has been $22 per person per day for the entire ship’s crew and $10 per person per day for the guide.” In our case, we massaged this a little, offering a little extra to a few people on the boat who went above and beyond our expectations. Tips ideally should be paid in cash because if you pay by credit card, it can take weeks for the crew to receive their money. In my opinion (and from some research I did), you should tip the same amount for children as you do for adults, as they take up a space on the ship and require at least as much attention as grown ups. Note: Exactly how much to tip was a big topic of conversation on our boat amongst guests. I’ll admit that as I prepared for our trip, I was a little surprised when I realized exactly how much gratuities were going to cost our family of four for the 8 days. Be sure to take this into consideration when budgeting for your trip. Will you get seasick on a Galapagos Cruise? I wondered if I would get seasick in the Galapagos and I did — on two occasions when we were crossing less protected ocean passages. I was not very sick and a little Dramamine took care of things perfectly. My kids each felt a little off once, but seemed to manage just fine without any sea sickness medication. We gave them kids Sea Bands to wear but I’m not really sure if that is what made the difference. What kind of snorkeling will you experience on a Galapagos cruise? Our snorkeling adventures on our cruise were different than I had imagined. I’m not sure why, but I had imagined a gentle entry off of a beach or off the ladder of our ship. More often than not, however, we entered the water over the side of our dinghy (Navy Seal style) and into a current. Adding to the challenge, was the fact that you were also supposed to stay with the group. Now don’t get me wrong, the snorkeling was great, it was just a little more vigorous than I had expected. One couple on our boat only snorkeled once, deciding that they preferred to view the sea creature over the side the dinghy instead. Above and beyond the aforementioned challenges, my husband and I also had to keep our eyes on our two kids who were not yet entirely confident with snorkeling. I had bought my daughter one of those full face snorkel masks, but this was simply not the place to try it out. We quickly reverted back to her standard mask and snorkel. Despite the fact that our visit was in the warm and wet season (warmer water, better visibility), I was surprised by how chilly the ocean was. Everyone wore wetsuits in the water, including our guide. Even my husband wore one, who had scoffed at the idea of buying wetsuits for our kids in advance of the trip. Can you dive on a Galapagos cruise? Very few Galapagos cruise ships offer diving as an add-on option. You generally need to either book a trip on a live aboard dive boat, or do your diving before or after your cruise. The majority of dive shops are in Puerto Ayora on the island of Santa Cruz, but there are a couple more on Isabela and San Cristobal. How fit do you need to be for a Galapagos Cruise? Excursions on our boat ranged from 1-3 hours. Most were not vigorous, requiring only an intermediate level of fitness at best, but the terrain could be a little challenging for some. My kids had no problem getting in and out of dinghies, or hopping from one lava rock to the next, but some of the older passengers on our boat struggled with this at times. I couldn’t help but think about how my own father would fare, having torn both Achilles over the past few years. If you have some mobility issues, you will want to make sure you have sturdy walking or hiking shoes and perhaps some trekking poles (our boat had them for use). I took this picture specifically to show what kind of surfaces we were walking on. This was the probably the most difficult section on our week long trip. Where do you find Galapagos cruise reviews? Scrolling through my go-to review site Tripadvisor, I discovered that ships aren’t listed like hotels. To find Galapagos boat reviews, you need to go to the Tripadvisor Galapagos Islands Forum and search for threads on boat reviews. 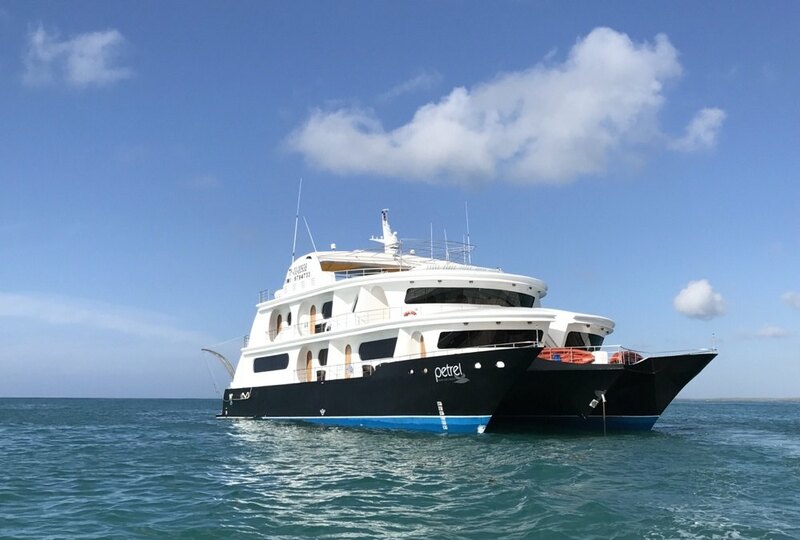 There are some websites that are trying to fill this void in Galapagos boat reviews, such as https://www.galapagosadvisor.com, so you may also want to take a peek there (I have a Petrel review there too). Can you get a deal on a last minute Galapagos cruise? Yes, you can, but a few tips will increase your chances of getting a Galapagos cruise for a discount. First of all, don’t go in high season when boats are generally fully booked in advance (June-Sept or Dec-Jan). Sign up for emails from the ships/companies that interest you and receive notifications on discounted sailings. We did meet a couple who had booked a luxury Galapagos cruise for 40% off. They researched the boats ahead of time (narrowing their list down to 1/2 dozen luxury ships). They flew to the Galapagos with a 2 week window to work with and ended up booking a last minute Galapagos cruise with the ship owners over the phone. There are whole travel forums dedicated to this topic (as there are several different ways to get a deal). Many people will go straight to the boat offices in Quito, with cash in hand, and negotiate directly. Years ago, my husband approached the captain of a boat that was about to depart from the Galapagos and paid a fraction of the listed rate. Now for us, this would not have worked, as we are now slaves to school schedules and are pretty much stuck with high season. For those people who have more flexibly however — I say, give it a shot ! I really like this Tripadvisor thread on how to book a last minute Galapagos cruise. Scroll right to the end for the most recent posts (as the thread was started in 2013). A reader has also made me aware of the site www.galapagoscruiselinks.com which is the only platform linking ships owners (who post their last minute availabilities directly onto that page) and prospective Galapagos visitors (e.g. no middleman). Other last minute sites will have an agent involved who works on a commission basis. Is there cell service in the Galapagos? The only decent cell phone coverage is near Puerto Ayora (Santa Cruz), Puerto Villamil (Isabela), Puerto Baquerizo Moreno (San Cristobal) and Puerto Velasco Ibarra (Floreana). I didn’t even think about checking my phone until I saw the crew checking theirs. They are a good gauge of where there might be a signal. Is there wifi in the Galapagos? If your ship has wifi, the signal is likely going to be terrible (and you may pay a hefty usage fee). Plan to take a break from technology. We did find cafes and restaurants that allowed us to quickly check our email when we hit the ports of Puerto Villamil (Isabela), Puerto Ayora (Santa Cruz) and Puerto Baquerizo Moreno (San Cristobal). The internet is fairly essential to both my business and that of my husband, but we planned accordingly. Honestly, it was wonderful to have a break from it. Do you need to be a birder to enjoy the Galapagos? This is specifically for my friend Sarah. She asked me this question before our trip, and I realized that I had pondered the same thing. Birders will love the Galapagos, yes. The birds are so weird and wonderful there though, and there are so many other species to enjoy, that I do not think you need to be a birder to enjoy the Galapagos. What is the perfect length for a Galapagos cruise? 6 days/5 nights. The is a completely subjective opinion, but I felt that 8 days was a little long for me and 4 days would have been too short. The one big benefit to taking an 8 day cruise, however, is the fact that you can visit some very distant islands where you don’t see many other boats. There were several times when we were the only ship around. Can you take children on a Galapagos cruise? Absolutely, and it is a wonderful experience. We waited to visit the Galapagos Islands with our kids until we felt that they were old enough to appreciate and remember them. In a perfect world, we would have visited prior to our eldest child’s 12th birthday and it would have been cheaper (we had to pay full adult fare for him on the cruise). Many boats will take kids on a Galapagos cruise from the age of 7 years. There are several that will take kids of any age including Lindblad Expeditions 48 guest National Geographic Insider and 96 guest National Geographic Endeavor ll. 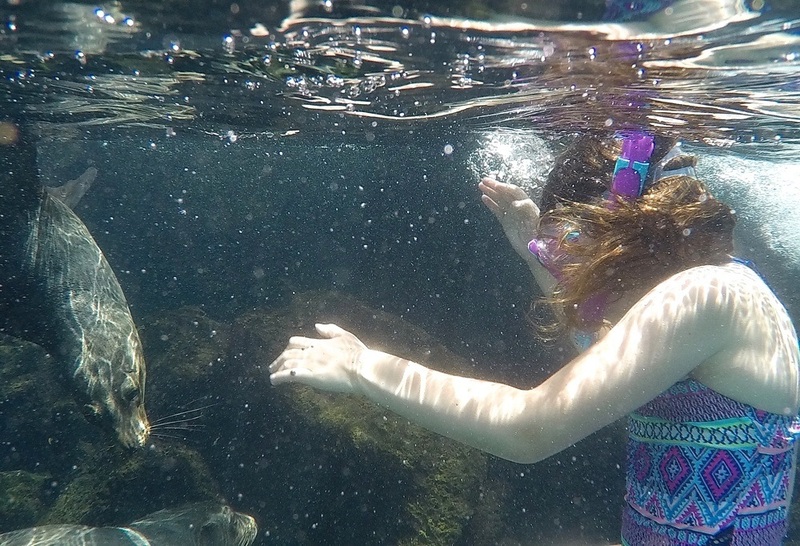 Children under 12 are usually welcomed on Galapagos cruises at a discount (25-50% depending on the ship). I recently discovered a site that allows you to do a search of boats that allow children. You can find it here: https://www.galapagosadvisor.com. As the policies regarding children can change, be sure to confirm this information prior to making a booking. 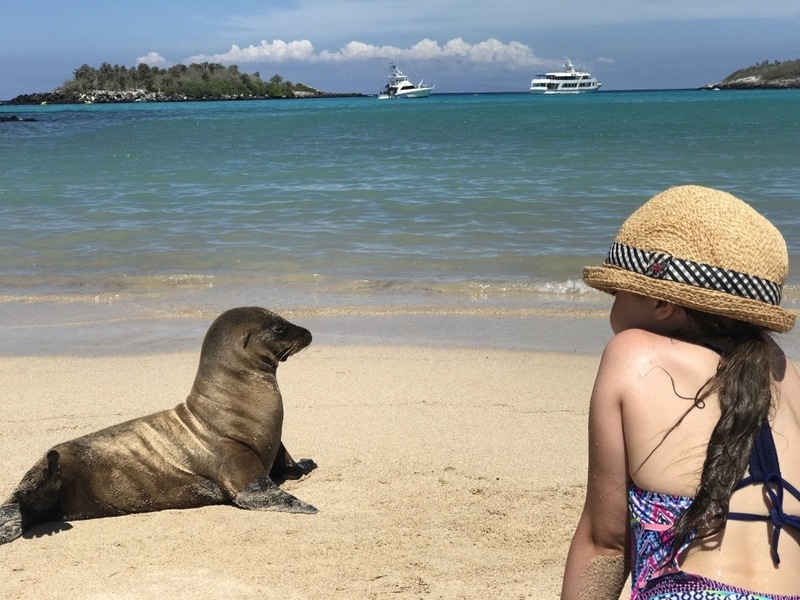 One important consideration when looking at a family cruise in the Galapagos, is the fact that most of the time when you leave the boat, you are on a guided tour, which can be hard for little ones. We chose a small boat with room for only 16 passengers because we simply are not big group people. Some families, understandably, might prefer a larger Galapagos boat specifically catering to family travelers. One advantage to this, is that guests can be divided into several smaller tour groups for excursions, with families grouped together (and the content adjusted accordingly). What should you pack for a Galapagos vacation? While I plan on writing a full Galapagos packing list post, for the moment, here are what I consider to be the key items. Quick dry lightweight nylon, linen or cotton clothing (including quick dry socks). The Galapagos Islands are very humid so any heavy cottons will take days to dry. Long sleeve lightweight shirts and long pants are nice because they will help to protect you from both sun and bugs. Our guide’s unofficial uniform, for instance, was lightweight nylon pants and long sleeve nylon shirts with under arm venting. His preferred clothing brand for the Galapagos was Columbia. Water shoes for wet landings on islands. We purchased Teva sandals which were very decent, but perhaps the most sensible shoes are Keens, because they are suitable for water and land, and most models have a closed toe which is great for walking on lava rock. Ugly as sin — but very practical. My husband, being a bit of a “gear” nut, chose the Merrell All Out Blaze waterproof trainer. Running shoes or hiking shoes for dry landings. My Nike Frees were fine, but you may want something more sturdy. A lightweight backpack (ideally waterproof). A camera. I used an iPhone 7 Plus. An avid photographer would obviously bring a better camera, but for the most part, I got the shots I wanted. A waterproof bag or large Ziploc to protect your camera while getting in and out of the dinghy. Extra rechargeable batteries and extra memory cards. There is a lot to capture and there also isn’t always a lot of time between excursions. Better to be prepared. Bug or mosquito spray. We did not find bugs to be a huge issues, but better not to take chances. 2 swimsuits. It’s nice to have an extra if one is drying. A sensible sun hat with a full brim, venting and a chin strap. This is perhaps the most important Galapagos accessory. My beautiful (and totally unsuitable) Jackie-O style Ecuadorian hat was a pile of shredded straw by the end of the week because it flew off into the ocean several times. 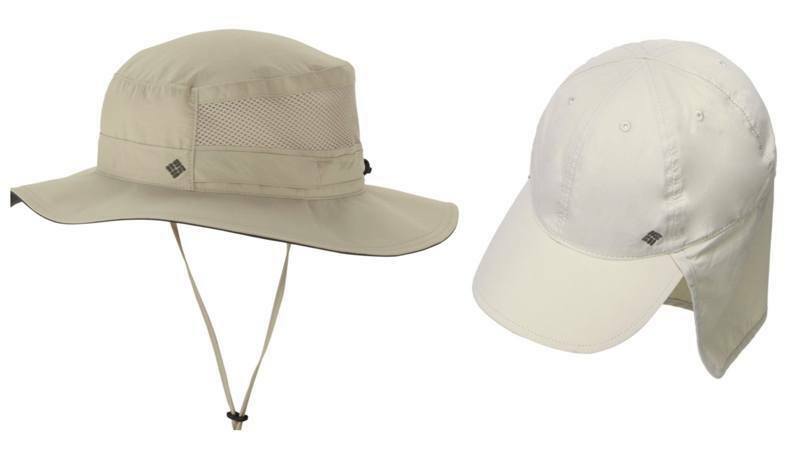 The following photo shows several of the right kind of hats for the Galapagos. Function over fashion people ! If you like to shop online like me, the following companies have a decent selection of gear suitable for the Galapagos: The House, Columbia and Backcountry. 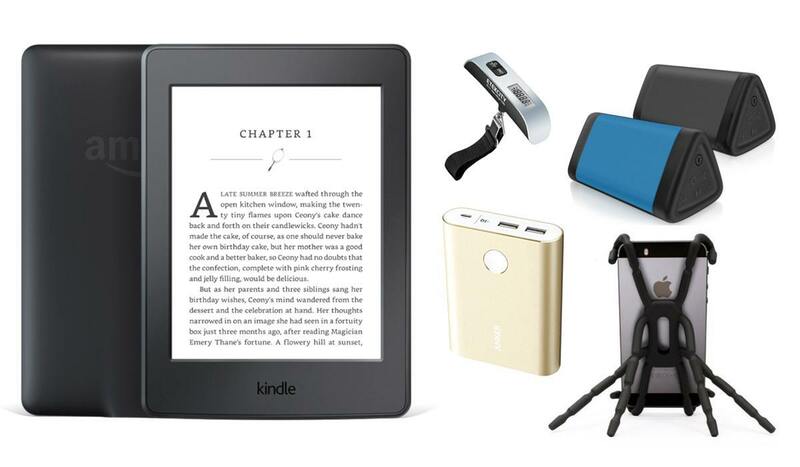 Affiliate Disclosure: We are a participant in the Amazon Services LLC Associates Program, an affiliate advertising program designed to provide a means for us to earn fees by linking to Amazon.com and affiliated sites. Professional Disclosure: I was offered a small discount on our Haugan Cruise. All opinions are entirely my own.